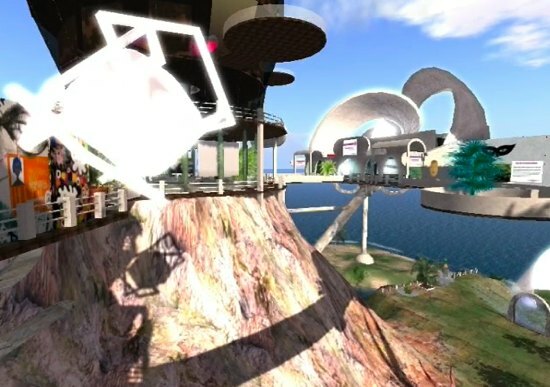 Will Shadows increase immersion in Second Life? A quick exploration of some of my old builds which may not be there much longer! Using the Space Navigator and running Windlight in Day cycle mode (the sun and moon take a minute or two to do a full rotation)Â to produce lots of moving shadows across the landscapes, people and builds. Rather than just show shadows I was keen to tie some ‘psych trance’ music into fast moving space navigator footage hence the constant movement – all shots took into account the timing with the shadows too. The whole process was about 1 hour of capture, 1.5 hour edit and 2 hours on music track. Music was composed on Logic Pro mostly using Spectrasonics Omnisphere plug-in software ‘processor-eating’ synth. I had access to a top end NVidia GTX280 high spec graphics card and quad processor machin so I put all SL graphics settings at max for once! The video was captured at PAL resolution using Fraps and the raw files edited using Adobe Premiere. To have a go at this yourself make sure you have a top flight graphics card from NVidia or ATI and then download the Shadow Viewer client from Kirsten here or I believe a more recent one (that I used) from Boy Lane here. I am not sure of the widespread use of shadows given the grunt your computer needs to handle this, windlight, voice on top of all the usual networking issues – but for those with computer horsepower it definitely brings the place to life.